Learn how you, a Workspace account administrator, can reset user passwords in the Workspace Control Center (including your own). Note: This article is specific to Workspace email passwords. If you are not a Workspace account admin, send these instructions to the account owner so they can reset your password for you. Click the Edit to open the Edit Account options. 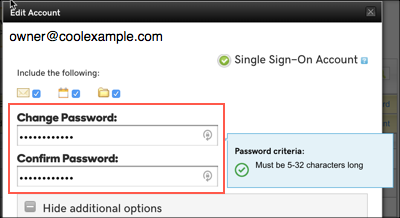 Enter the new password in the Change Password and in the Confirm Password fields. Click Save. You may need to close the Edit Account page. You should see confirmation notices as that password update applies to other account areas such as calendar. Note: It can take up to 30 minutes for your new password to that effect. After 30 minutes have passed, have your user try logging into their email again.